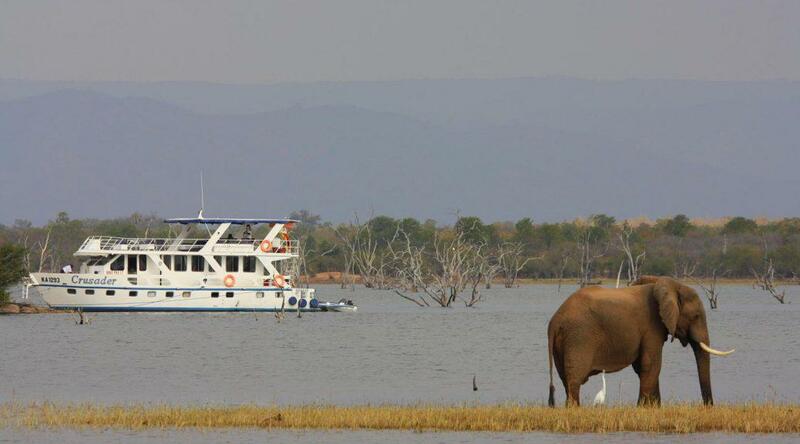 Travellers who have been to magical places like Mana Pools, Gonarezhou and Kariba will always return to Zimbabwe. However, currently there is uncertainty about what to expect from the numerous police roadblocks and the cash crisis in the country. 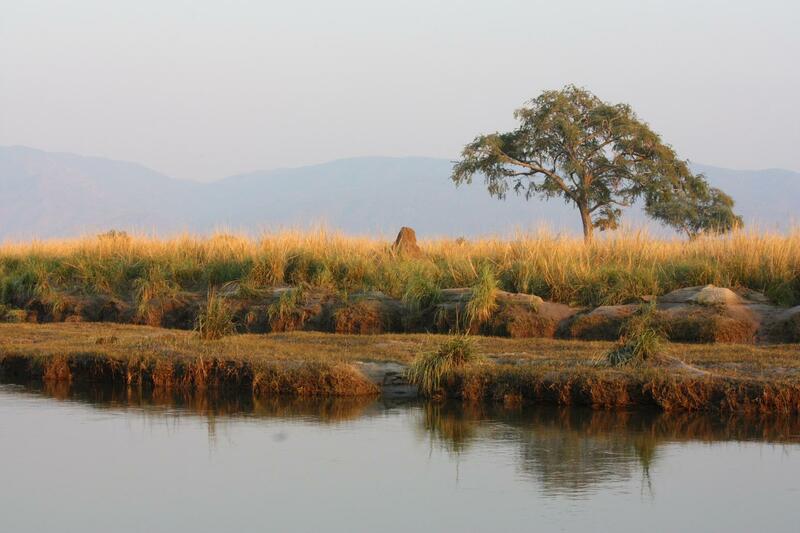 The magic of Mana Pools. Zimbabwe, with its political turmoil of many years, is still facing a huge economic crisis and has become expensive if you don’t come from a dollar based economy. Due to these factors the once flourishing tourist industry of Zimbabwe has dwindled to add just a few drops in the state revenue bucket. In spite of all the negative factors, we are some of those Zim lovers who will always return, no matter what. Shortly before our visit at end August 2016, we were quite concerned about the cash crisis and reports of harassment by the Zim traffic police. However, I am glad to report that we enjoyed Zim as much as ever, even though it was sad to see the decline in the overall state of this magnificent country. We opted to travel through the Kruger NP, exit South Africa in the north of the park at Pafuri and drive 61km on the backroads of Mozambique to enter Zimbabwe at the small but efficient Sango border post. We chose this route as we wanted to bypass the notorious Beitbridge entry point and also because we had heard that the traffic police roadblocks were particularly bad on the Beitbridge – Harare main road. For us this turned out to be a wise and very pleasant option as we really enjoyed Kruger NP and found the short Mozambique stretch very interesting. I would advise against doing this route during or shortly after the rainy season as you have to drive across both the Limpopo and Nuanetsi River beds. 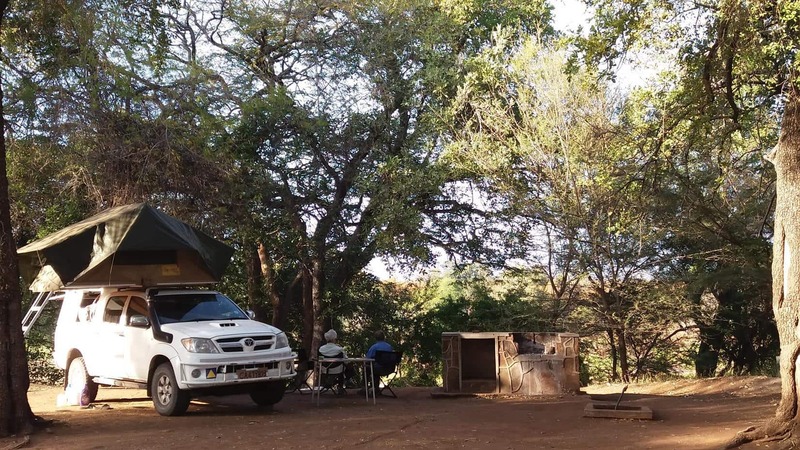 We had an easy border crossing at Sango and thoroughly enjoyed the magical ambiance of Mabalauta camp in the south of Gonarezhou NP before we continued north. The friendly immigration officer at Sango informed us that this quiet border post only gets about six vehicles per day during the peak season! The Australian passport holders in our party managed to obtain Zimbabwean visas at this small post. Camping at Mabalauta in Gonarezhou. The Zimbabwean dollar was abandoned as the official currency in 2009 in favour of the American dollar. Bond coins have been in use for some time now and are used for giving change of less than one dollar, but seem to be regarded as a bit of a joke by most local people. The Zimbabwe Reserve Bank reputedly plans to release bond notes in October this year, but nobody we spoke to was happy about it as they don’t have any trust in a local currency after the collapse of the Zimbabwean dollar. It remains to be seen if government will indeed print the bond notes. At the moment there is a shortage of US dollars and banks have limited the amount of cash that can be withdrawn per day. For this reason the South African rand is accepted everywhere (except by informal stall holders) even though you might not always get the most favourable exchange rate. It is possible to pay by credit card in most formal stores. Travellers would be wise to bring sufficient cash (US dollars or SA rand) for the holiday expenses that they cannot pay by credit card. Currently there is no restriction on the importation of currency in Zimbabwe, however, keep in mind that you have to declare an excess of USD 1 000, Euro 1 000 or ZAR 20 000 when you enter or exit the country. Take enough one dollar notes with you, as most consumables in Zimbabwe (from a pen to a loaf of bread!) nowadays cost one dollar. 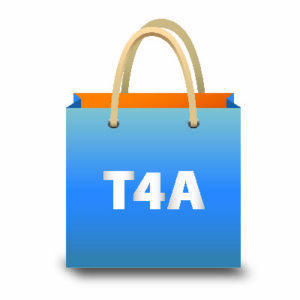 The shops in Zimbabwe are well-stocked but anything more than the basics is more expensive than in South Africa. Fuel is readily available (although you don’t always get 50ppm diesel) but it is also more expensive than in SA. During our visit people in Harare protested as they were sick and tired of the constant traffic fines. Apparently they could not leave their homes for work, school or shopping without getting a daily 20 dollar fine! According to hearsay the police officers had not been paid for the last six months; hence their concentration on road blocks and fining citizens and tourists alike for even the slightest offence. This week the Finance Minister of Zimbabwe admitted publicly that government is battling to pay civil servants. Shortly before our arrival it was reported on Facebook that there was a huge improvement on road blocks between Harare and Bulawayo, and Bulawayo and Vic Falls. People were mostly waved through at roadblocks and no lengthy harassment was reported on these roads. 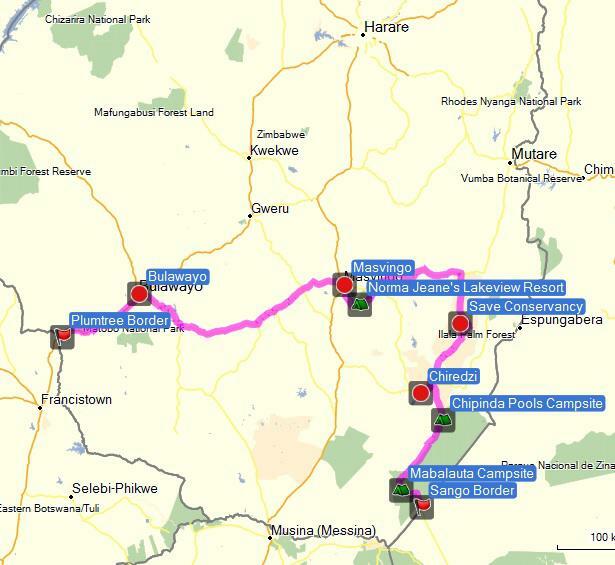 We did not traverse any of these routes, but we travelled on the main road from Masvingo to Bulawayo and on to Plumtree and did indeed encounter many police roadblocks. At one road block a police officer threatened to fine us USD 5 per log for the firewood that we carried on our roofrack. According to him we needed to show a receipt or a permit for the wood as chopping trees for firewood was, according to him, not allowed in Zimbabwe. As we had bought the wood from the roadside we didn’t have either a receipt or a permit and the officer would not accept our assurance that we did not cut the firewood. We knew that the police were just out to fine us, so we refused to pay and did not offer a bribe either, offering instead to be arrested and charged. When Pete, my travel partner, indicated that they would have to jail him for the ‘offence’ the officer let us go with a warning to take note of our ‘offence’ for future reference. Other than this incident between Masvingo and Bulawayo, we were waved through six more road blocks on this stretch and at one stop asked for the vehicle’s Temporary Import Permit (TIP) and Pete’s driver’s license. Between Bulawayo and Plumtree we were stopped once and were just greeted and waved through by the friendly police officers. In spite of us reading up on all vehicle requirements and doing our best to adhere to them all, our vehicle wasn’t checked once. Even our homemade front number plate (which we made whilst staying over in the Save Conservancy since we lost ours in Kruger NP) passed the test! You must carry a driver’s license at all times. Domestic driver licenses issued in Malawi, South Africa, Namibia, Botswana, Lesotho and Swaziland are valid in Zimbabwe. All other visitors must have an international driver’s license. Foreigners should always carry a passport. All foreign registered vehicles require a Temporary Import Permit (TIP) which can be obtained free of charge from the customs official at the border post. It is required to have two warning triangles (plus two more if you tow a trailer or caravan), a 1 kg serviceable fire extinguisher, serviceable spare wheel, working jack and wheel spanner. It is required to have tape reflectors on each corner of the vehicle: white on the front and red at the rear. Trailers and caravans must display reflective T-signs on a black background: a white T-sign must be placed on the extreme right on the front of the trailer/caravan whilst two red T-signs must be placed on each side of the rear of the trailer/caravan. If the combined length of your vehicle and trailer is more than 8m, you must have a continuous yellow reflector strip down the sides of both the vehicle and the trailer. Pick-ups, twin cabs and light trailers must have a continuous red reflector strip to within not less than 40cm of the outer edges at the rear. Pick-ups and twin cabs are classified as commercial vehicles and must therefore display Gross Vehicular Mass (GVM) and Nett Vehicular Mass (NVM) figures on the left side. Note that all reflectors must be of honeycomb or diamond grade. A reflective emergency jacket is recommended. In addition to headlamps vehicles are not allowed to have more than two pass-lamps, fog-lamps or spotlights. Your vehicle’s number plates, windscreen, headlights or the driver’s window may not be obscured by mud or dust. A windscreen with a crack that obscures clear vision is also illegal. Previous PostKruger NP south to north and beyond…Next PostThe Kalahari is not for sissies! – no road blocks, very easy and friendly travelling all over the country! Hi Fabi, thank you for the update. We have heard lots of positive things about travel in Zimbabwe recently and I believe their tourism industry is picking up. What is actuall currency in Zimbabwe? Do they accept USD? The actual currency in Zimbabwe is USD at the moment. Hi Ethan, as Janine mentioned Zimbabwe is using USD as their currency, but we have had reports from other travellers that you should not rely on ATM’s to withdraw cash in the country. Rather bring enough USD with you and be sure to bring enough 1, 5, 10 and 20 dollar notes as change could also be a problem, especially at road blogs/toll gates. I like the idea to bypass the heated Beitbridge entry point, crossing the border at Pafuri. I will be there in the middle of august. Do you have any experience to cross Limpopo and Nuanetsi River beds in that period? Can you give me more informations about the 61km of backroads? Hi Karen, i am planning on going to Gonarezhou at the end of April, i would like to cross the Limpopo at Pafuri, do you have any information about the river level at present, are vehicles crossing? Plumtree;Big Cave Camp Matapos; Victoria Falls; Ferry up Lake Kariba; Chinhoyi; Norma Jeans @ Great Zimbabwe; Big Cave Camp; Plumtree. Was awesome trip using an Avis Safari vehicle (Ford Ranger 4×4 with two roof tents). Highly recommended. Police stops not a issue, normally waved thru / licence checked. When greeted in a friendly manner, on my way very quickly. Did find that i could not withdraw cash at the atm and the counter staff at a branch couldnt give me cash either. A local friend loaned my some cash, so take plently with you, preferably small so you can pay the $3 road tolls. Frank, according to the rule book your troopie is not classified as a commercial vehicle. However, I have heard rumors of people with Landcruisers that were fined because they did not display GVM and NVM figures. If they want to fine you, they will find a reason…. Thanks Karin. Especially the list of vehicle requirements is very useful. Are troopies considered a ‘commercial vehicle’? We travelled from Hwange Main Camp to Victoria Falls in August 14, crossed 5 or 6 roadblocks, stopped twice, they checked our plate lights ( working ) turning lights and fire extinguisher. Since all was ok, we had no problems. No roadblocks between Victoria Falls and Kazungula.